(Irvine, CA) - Now available from Zyrus Press: the new 2008 Hobbies and Collectibles Catalog featuring nine new book releases from a team of experienced and seasoned authors. 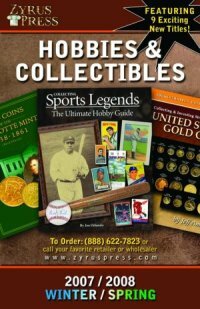 The catalog presents a diverse array of titles, including the long anticipated Numismatic Photography, by Mark Goodman, and Collecting Sports Legends: The Ultimate Hobby Guide from Professional Sports Authenticators, a division of Collectors Universe. The 2008 catalog also introduces an entirely new line of books - The Official Strategy Guide Series - by numismatic expert and professional auction cataloger Jeff Ambio. Collecting and Investing Strategies for U.S. Gold Coins, set to release in February, will be followed in May by the second release, Collecting and Investing Strategies for Walking Liberty Half Dollars. Strategy Guide books on Barber Coinage and the Seated Liberty series are scheduled to release in late 2008. All backlisted numismatic favorites are listed by category. A few of our best sellers are: Photograde, The Authoritative Reference on Buffalo Nickels, A Buyer’s Guide to Silver & Trade Dollars, and Gold Coins of the New Orleans Mint.